Few business cases are as rich with soaring success and abrupt failure than the story of Kodak. What was once considered a hub of technological wizardry suddenly became a bankrupt institution with little hope of surviving much longer into the future. All of this begs the question – what happened? Why was a company, full of intelligent people, so slow to adapt to a market that though seemed to change over night, actually transformed itself over the slow period of roughly 20 years? To answer these questions, let’s analyze the market for film and the emerging competition from digital cameras. 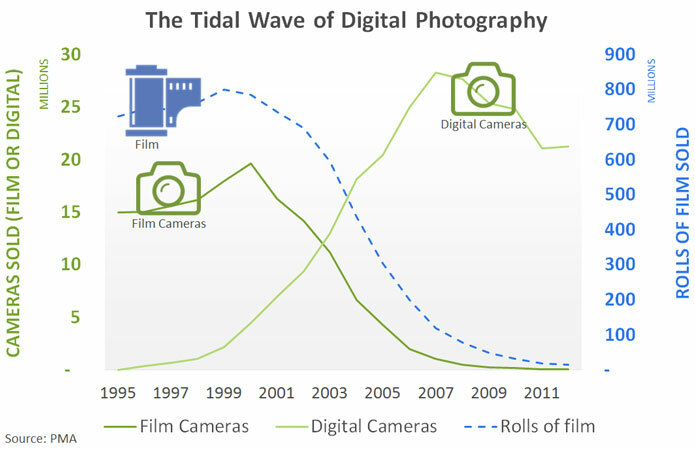 The chart below illustrates sales of film alone, film cameras, and stand-alone digital cameras over time. Note that the film sales in blue are represented by the right side axis while the camera sales in green are represented by the left side axis. Stand-alone digital cameras peaked in 2007 – the year the iPhone was announced. But this graph is just the output of what happened – or the end result. It doesn’t explain why this market changed so dramatically. To understand that, we need to analyze the economics underlying the photography industry. If you assume the storage is film and processing is taking the roll of film to the drug store for printing, this pretty much sums up the costs incurred for photos during the days of film. In digital photography the storage costs rapidly go to zero (cost of memory that is amortized over limitless reuses) and the processing price is also zero if you can simply share your photos online through social media. With this as a framework, in 1999, Kodak’s best year, the cost of a photo could be calculated by assuming the use of a one-time-use camera which was both the roll of film and camera built into one disposal device. These can still be purchased today for $10-15/ea. The processing price was the cost to have the exposed film processed by a processing location (usually in places like supermarkets or drug stores). This usually cost around $3-5. So the cost of a fully processed roll of film, which usually held 27 pictures, was roughly $15. On a per image basis, this comes out to 56 cents. On a per image basis, this comes out to 54 cents – the majority of the cost being driven by film costs (or storage) and processing. Practically the same as the one-time use cameras. Even if the camera itself was free, the overall cost would still be $12/roll. 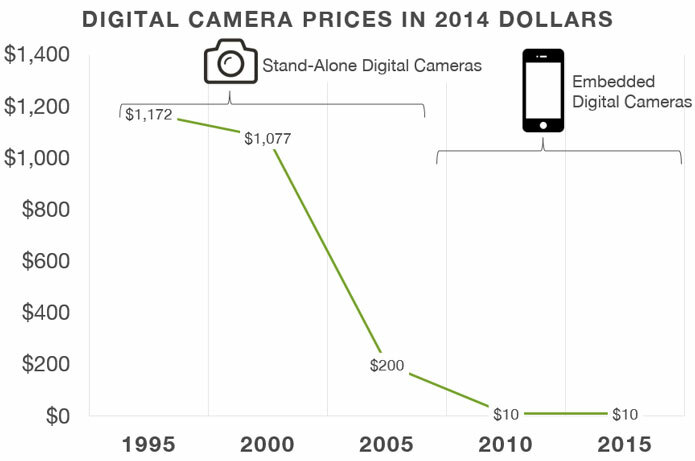 This is why one-time use cameras became so popular before the price of digital cameras came down. This was Kodak’s hey day. At 80% margins on a roll of film, the company had every incentive to keep film around for as long as possible. Kodak’s profit party wouldn’t last though because soon the economics of digital cameras would prove to decimate their business model. As digital cameras began to emerge in the early to mid 90’s many people couldn’t justify purchasing them mostly because of switching costs involved. Digital cameras of the day required the user to have a computer to process the images on and a printer to print them out for sharing with others – a process that was foreign to all but the most techie of consumers. At the end of this process, the images didn’t look as good as film-based photos either. But as digital camera capabilities improved and more computers became mainstream along with internet access in the late 90’s, sharing high-quality photos became as simple as sending an email. With storage and processing costs virtually eliminated from the equation, the only thing digital cameras needed was time before they came to dominate photography. Several estimates of the iPhone bill of materials list the camera somewhere between $5-15. The graph above pretty much says it all. Let’s analyze three scenarios for the cost of images using digital equipment. To make the comparisons fair, lets assume the digital cameras can take 5400 photos before wearing out. Much better than 50+ cents but still not a great option due high switching costs. Let’s do the same analysis for the $200 camera. That’s a substantial reduction from 50 cents – and because by 2005 many people had high-speed internet connections and access to a computer, the switching costs were coming down. Digital was the only thing that made sense anymore. 2005 was a turning point year for Kodak. Though they managed to maintain revenues somewhat in line with their historic performance, the foundation of their business began to show serious cracks. It wasn’t that Kodak didn’t offer digital cameras, they had both invented the digital camera and introduced a number of digital cameras to professionals and consumers by 1995, the issue was that Kodak couldn’t reconcile going from the 80% margins of film to single digit margins in digital. It was a classic case of the innovators dilemma. 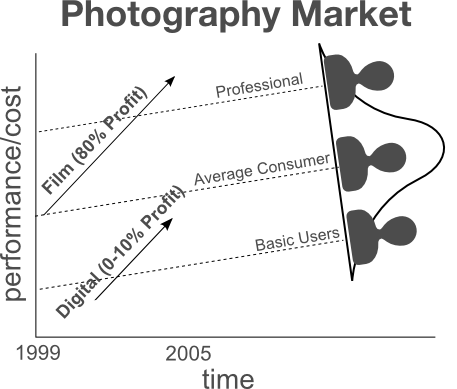 By 2007, stand-alone digital cameras were peaking in sales just as built-in digital camera modules, a new form of digital cameras, would begin to disrupt the photography market again. In 2007, Apple embraced digital camera modules by including a $10-15 camera in it’s first iPhone. Owners of an iPhone now were able to take photos, store, process and share them all with one device. It’s important to note that this number is only relevant on a comparative basis with the other technologies. It’s quite likely that people take more or less than 5400 photos with one camera but to make this an apples-apples technology comparison I chose to make that variable constant. Since smartphone cameras have grown in functionality, the number of photographs people take per day/year has grown exponentially. Benedict Evans has written a great post on this. With virtually no switching cost and extremely low device costs (because it was bundled with the overall phone) people would take more pictures than ever before. From this data we can see that Kodak was basically the same size in 1999, on a number of images processed basis, as Instagram was in 2013. This is important because on March 31st 1999, Kodak’s market cap was $20.9B. On that same date, Kodak employed roughly 83,000 people. Compare that with Instagram getting purchased by Facebook for $1B in 2012 when it had 12 employees and no revenues. When you consider that Instagram can provide more value to the average person taking photos than Kodak can, you get a sense of the seriousness of Kodak’s situation. Bottom line, Kodak was never going to maintain their film-related revenues and profitability if they stayed in the consumer photography market – film or digital. As Japanese industries rose to prominence in the 70’s and 80’s, there was one company that quickly became a sharp thorn in Kodak’s side. Like many successful Japanese manufacturers at the time, Fujifilm was aggressively expanding into new markets and would do so by competing on price at the expense of double digit margins. As the digital age emerged and each business recognized the eventual death of film, Kodak invested heavily into digital photography while Fujifilm placed its bet on document solutions. In 2001, Fuji purchased the majority of shares in a joint venture they had created with Xerox long ago in the 1960’s to build copy machines in Japan. Bringing the majority of profits from this business under the Fujifilm umbrella is often cited by the company as the shelter under which they weathered the digital photography storm. This is a nice illustration of how Fujifilm mixed their revenues out of film products as they began to decline and mixed in revenues from document solutions which though not necessarily growing, was still a relatively stable market. In 5-10 years they’ll probably need to have another graph like this that shows them mixing out of document solutions and into some other business platform as well. 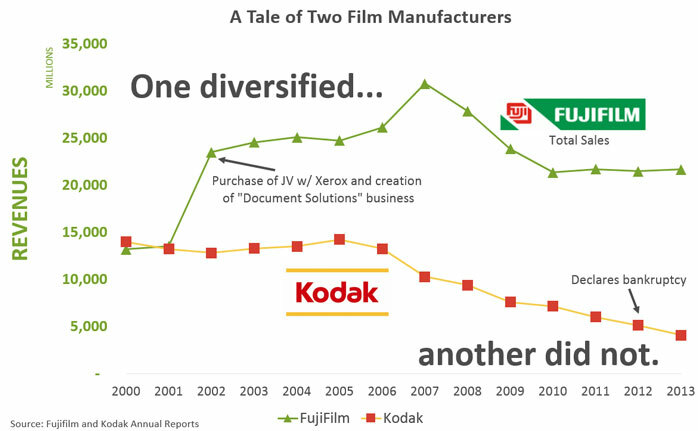 In the graph I label Fujifilm as diversifying their business and Kodak as not diversifying. I don’t mean to say that Kodak didn’t do enough to diversify out of film – they actually foresaw the death of film long ago and invested heavily in digital products. What I mean is that hopping from one technology to another within the same market is not diversifying. To truly diversify and save their business, Kodak needed to move into other markets that were either growing or stable and that maintained healthy levels of profitability. To do that, old dogs like Kodak must learn some new tricks. This prescription sounds great but sometimes it can be tough to know what market to go into. For help in that regard, sometimes all it takes is thinking about the adjacent spaces near the edges of your business. 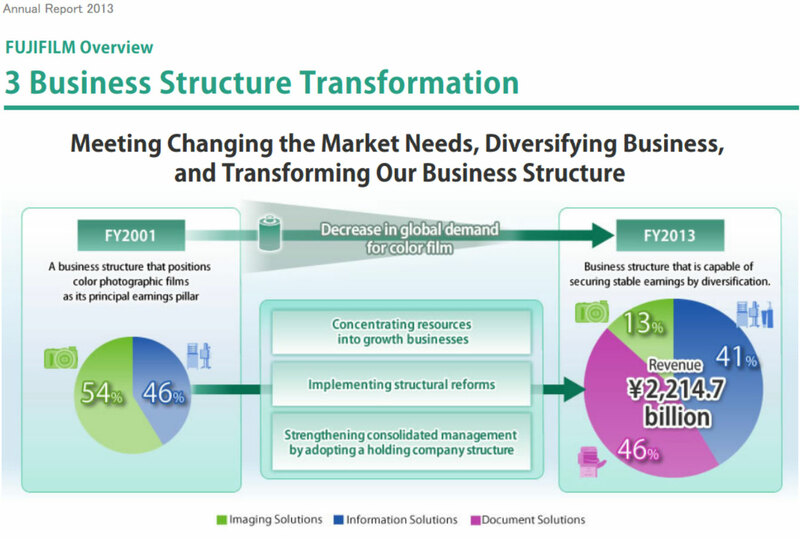 To illustrate this, Fujifilm included several examples of adjacent markets they viewed as business growth opportunities. 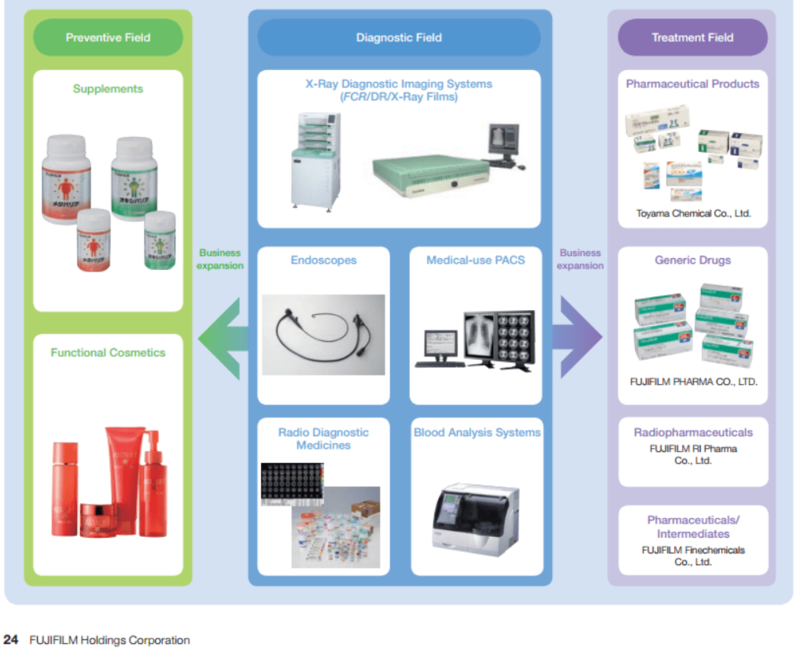 This graphic from their 2010 annual report shows how Fujifilm was analyzing where they could expand to within the health care field. They already provided several health care diagnostic solutions but what if they expanded into preventative care or health treatment products? 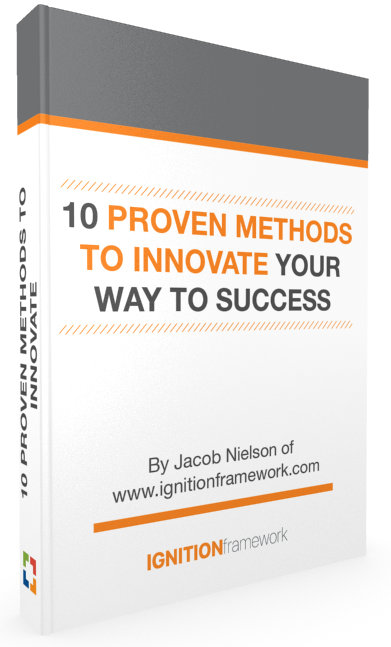 Because adjacencies are so close to the business, typically you’ll discover synergies that can improve the value of your offerings over other competitors who may only understand one piece of the puzzle. For example, if Fujifilm’s diagnostic capabilities allow for precise and accurate diagnosis of certain ailments, having that data may help them improve the effectiveness of the treatments for that ailment versus another drug company that doesn’t have as much diagnostic data. Kodak’s fall from an industrial giant to a bankrupt institution is unfortunate because it was preventable. Just look at Fujifilm for proof of that. The sad part about it is that Kodak supported tens of thousands of people in addition to being a pillar of the Rochester NY community. Anytime a large company like that begins to fail it impacts a lot of people. 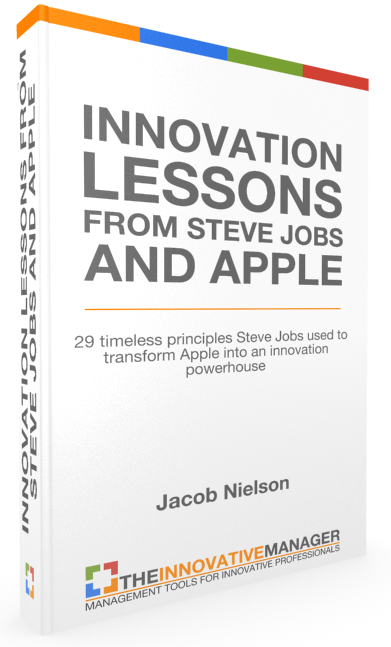 The silver lining to the story though is it provides business leaders around the world with a rich story to learn from. 6 Responses to "Story of Kodak: How They Could Have Saved The Business"
Certainly, there was an unwillingness to give up a profitable core business and to move to something else; however, I would suggest that this holds true for every other well-run company facing discontinuous change too. So in this aspect I would not necessarily identify something specific that had been at work at Kodak. In contrast, data gathered in our research strongly confirms your point on Kodak’s diversification efforts. Here I may add that Kodak was neither reluctant nor inert towards diversification. Rather the opposite was the case. As you suggest, Kodak quite early identified the upcoming threat of digital imaging. For this very reason, in the mid-1980s CEO Colby Chandler diversified in many directions (document imaging, copier business, blood analyzers etc.). CEO Whitmore continued this path and tried to leverage Kodak’s capabilities in chemical engineering even to pharmaceuticals. Nevertheless, two issues thwarted their endeavors: First, in none of the diversified businesses Kodak managed to develop a leading market share, which is often associated with business profitability (e.g., due to economies of scale). This meant that the various businesses, which all were trying to build a competitive advantage and taxed for available cash flows, burdened rather than improved Kodak’s balance sheet. This leads us to the second point. Kodak had to fund diversification efforts on the ground of debts. By the end of the 1980s, Kodak’s total capitalization was indebted to about 70 percent! But the businesses barely generated the funds required to pay back debts. As a consequence, in 1994, when George Fisher got appointed new CEO of Kodak, the only way to pay back debts and to generate cash required to move into digital imaging was to divest all non-imaging businesses. Basically, he was forced to bet on the viability of Kodak’s core (and profitable) photographic film and paper business. His believe was that growth in this core business (e.g. by geographical expansion to China or India) would generate additional funds for the development of initiatives in the digital imaging division (which lost money well into the mid-2000s). When film went down all its big, vertically integrated production facilities then started to burden Kodak’s balance sheet. A gap between sales and costs emerged, forcing the company to downsize belatedly, which tremendously constrained its response to digital imaging. Michael, great comment! I apologize for my very late reply. I have had some problems with my commenting system. 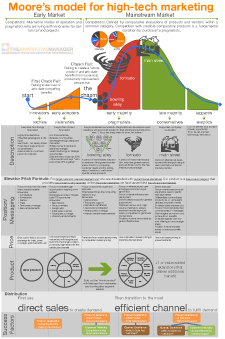 You make an excellent point about diversification and the constraints on cash flow that come with it. Sounds like Kodak should have made one or two major investments in other cf generating companies rather than throw many projects at the wall to see what sticks. Can anyone help me to make intro of the case?